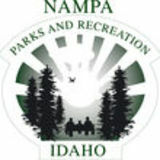 To obtain contact information for a specific Parks and Recreation staff member, please visit our website at nampaparksandrecreation.org. 0-5 years	$2.25/day 6-17 year	$6.50/day Adult 18+	$8.50/day Senior Citizen 65+ $6.50/day Passes are non-refundable. 20-Visit Punch Pass Rates	Tot 0-5	$34 Youth 6-17	$84 Adult 18+	$124 Senior Citizen 65+	$94 Passes are non-refundable. Annual Membership Rates Individual $400 Individual Youth $280 Family* $718 Senior Individual 65+	$320 Senior Couple* $578 Memberships are non-refundable. Ages 5yr and under Monday-Saturday: 8:45am-1:30pm Monday, Wednesday & Friday: 4-8:15pm Tuesday & Thursday: 4-9:15pm $2.50 per child/hour (2hr limit/day) Play Center services are for parents or legal guardians while present in the Rec Center. Punch Passes are available. Enjoy the convenience of on-going monthly payment drafts directly from your debit or credit account. A minimum 12 month payment contract agreement is required and a one-time $40 activation fee applies. Initial Monthly Rate Individual $35.25 Individual Youth	$24.50 Family*	$63.00 Senior Individual	$28.00 Senior Couple*	$50.75 The first month’s fee is prorated. All other payment drafts occur on the 1st of each month. All memberships, and subsequent monthly fees, are subject to annual price increases. Annual price increases, if applicable, take effect on October 1st of each year. Memberships are non-refundable. All Day Pass, Punch Passes and Membership rates include tax. *To be eligible for a NRC family or senior couple membership the primary member and spouse must be legally married as recognized by the State of Idaho. In addition, only children considered legal dependents ages 18 and under may be included on a family membership. Provisions may be made to place dependent children ages 19 through 21 on a family membership. See the NRC Membership Eligibility policy for details. The NRC may ask for proof of legal dependency or a marriage certificate from anyone registering for a family or senior couple membership. nampa rec center The Nampa Recreation Center is a 140,000 square foot indoor facility offering many recreation amenities to the public. Our mission is to provide quality programs and services, be responsive to the citizens, and play an active role in making Nampa a healthy community. To ensure the safety of our members and visitors, the Nampa Recreation Center will enforce all policies and procedures. For a complete list and description of policies, please refer to our website at www.nampareccenter.org or pick up a copy at the Rec Center Front Desk. Specific guidelines are available in each department of the facility. 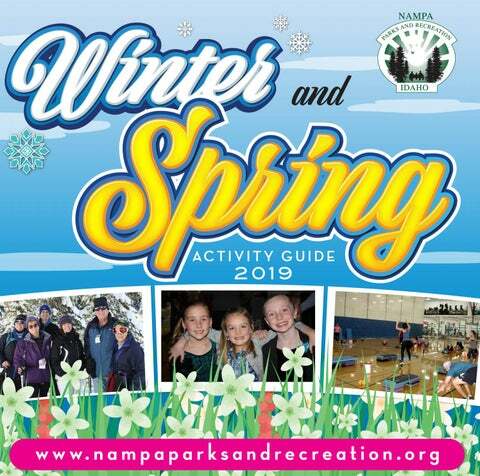 Register for Nampa Parks and Recreation Department programs, classes, and sports leagues online at nampaparksandrecreation.org or in person at the Nampa Rec Center, Monday-Friday between 8am-7pm. Register early to avoid canceled classes! Registration fees include sales tax, where applicable. View all registration and refund policies online at nampaparksandrecreation.org. The Nampa Parks and Rec Department provides accommodations for youth with disabilities to participate in any recreation program. For more information or to set-up assistance in advance, please contact the Nampa Recreation Center. Details for each amenity are located within this guide or on-line at www.nampareccenter. org. Please call 208-468-5777 with any questions or come by for a tour! give the gift of health Good for memberships, day passes, swim lessons, programs & more! The combination of elegant atmosphere, creative food presentation and helpful staďŹ&#x20AC; makes the Nampa Civic Center one of the leading event facilities in Idaho. Reach your fitness goals by creating your personalized workout with one of our trainers. Meet with our trainers to change up your current workout to make improvements & to stay challenged! Use your body weight to develop strength, cardio endurance, balance, core stability & flexibility simultaneously! Get an evaluation of your current fitness level to set goals or check your progress. Ongoing sessions (60 minutes) which build upon the foundations of the preceding sessions will provide the extra motivation, variety and accountability to help you reach your health, fitness or performance goals. Questions, pricing, or to schedule sessions, contact Sherri Moro at 208-468-5884. Learn about fueling your body to reach your weight loss or performance goals! Use vibration training to increase strength, muscle mass, flexibility and balance with less stress to the joints! Learn correct technique to maximize results & avoid injury with this dynamic workout. NRC Members receive four personal training sessions a year & Punch Pass holders receive two personal training sessions a year for FREE! STOP IN OR CALL THE WEIGHT ROOM AT 468-5884 TODAY TO LEARN MORE OR SCHEDULE AN APPONTMENT. The weight room is reserved for individuals 15 years and older. Youth 13 and 14 years old may obtain weight room privileges by completing the NRC’s Youth Strength Training Course. The NRC offers the ZONE for 10-14 years olds and functional training under certain parameters for those as young as 6 years old. Each youth participant must complete an orientation with a trainer and sign a “Youth Training Pledge and Consent” form along with their parent before engaging in training. Stop by the weight room to have your blood pressure checked anytime. Trainers are available to assist any member needing special assistance due to physical limitations. To request assistance, talk with a trainer. All about the end game. The best kind of care is tailored to your needs and helps you recover quickly and with less pain. Thatâ&#x20AC;&#x2122;s why our Sports Medicine Specialists focus on each individual athlete, listening to your goals and concerns. From overuse injuries to long-term strength training and injury prevention, we help you meet your goals, stay injury free and stay in the game. Because at Saint Alphonsus it is all about you. STARS PHYSICAL THERAPY LOCATIONS CLOSE TO HOME! Try one of our Group or Aquatic Fitness classes for a motivating and comprehensive workout. Classes are offered at no additional cost for members and day pass users. *Due to limited space, please sign up at the front desk no more than 2 days prior to class Current group and aquatic fitness schedules with class descriptions are available at the Rec Center or on our website under“Fitness Schedules”. Jump on a paddle board and enjoy the benefits of both water and land. Different fitness techniques including HIIT, yoga, muscular strengthening, balance, stretching, and relaxation will be mixed into a fun and challenging workout using a paddleboard, paddle, and resistance bands. Class is offered at no additional cost with your membership or day pass entry. CALL 208-468-5858 FOR MORE INFO OR VISIT US ONLINE AT NAMPARECCENTER.ORG. Snacks are provided for program participants. Parents must provide their children with a lunch for the Full-Day program. Parents may choose to purchase a lunch through the Rec Center. Meal is provided by either Blimpies, Pizza Hut, or Del Taco. Cost is $3/lunch, $13/5-punch card or $25/10-punch card. Enjoy swimming, court games, rock climbing, & more! •	Parents or legal guardian must register child(ren) for the event. •	Parents must check child in with staff upon arrival •	Register by 7pm the day before the event to avoid a $5 late fee. •	Children must be picked up between 8:30-9am the next morning. •	$5 late fee applies each 1/2 hour after 9:05am. Early childhood education is the first building block for a lifetime love of learning! Preschool classes at the Nampa Rec Center are offered for 3 and 4 year olds. Teacher bios can be found on our website on the “Staff Directory” page. Classes are ongoing, for more information about classes and availability please call 208-468-5858. Registration for 2019-2020 school year will begin May 3rd at 8am. Sponsored by the Nampa Recreation Department. Offered in cooperation with the Nampa School District. This program will provide an opportunity for youth to learn basic skills and teamwork in a recreational atmosphere. Children register on a team coached by a parent volunteer. Each week, teams will have two 1-hour practices (Kindergarten and 1st Grade teams will have one 45-minute practice). Games are played on Saturdays. Practices and games are held at Nampa School District gyms. January 7-February 16 Kindergarten/1st (coed) 2nd/3rd Boys, 4th/5th Boys, 6th Girls, 7th/8th Girls $30 Register by December 18 & receive a discounted rate of $25. Coaches needed! If you are interested in working with or coaching a team let us know on your childâ&#x20AC;&#x2122;s registration form. This class teaches self confidence, builds self-esteem and improves balance, while establishing discipline and courtesy towards others. Participants will learn age appropriate self-defense and weapons training. These classes are non-violent; sparring is optional. Gymnastics is a great Physical foundation for kids of all ages that helps develop strength, coordination, physical fitness and self-esteem. It will help prepare children for participation in all kinds of sports. Our instructors will help guide children in a positive atmosphere that helps develop their skills and self- confidence. Each class is designed to teach progressions safely and allows the child to move at their own pace. An afternoon of holiday fun! Moms and sons, it is your turn to spend some time one on one. Enjoy Pizza, Basketball, Dodgeball, fun games, photo booth, and more. All participants are encouraged to wear your favorite sports team gear. Don’t miss this great opportunity to connect with your son, take part in several different competitions and make lasting memories! Call 208-468-5858 for more information. GAMES • PIZZA • PHOTO BOOTH • LOTS OF FUN! DATE NIGHT Dads, this is the perfect opportunity to spend an evening with your daughter(s). Join us for an evening of fun, entertainment and refreshments. Free Day & Wellness Fair at the Nampa Rec Center! Call 208-468-5777 for more info. GET YOUR TICKETS ONLINE AT NAMPARECREATION.ORG OR CALL 208-468-5858 FOR MORE INFO. Climb up, hop in and enjoy the Rec! 1st & 2nd Friday of every month enjoy extended slide and diving well hours until 9pm. Top rope climbing wall will be open 5-9pm. The Nampa Rec Center houses five swimming pools for your exercise and recreational enjoyment. Enjoy access to the Lap Pool, Rec Pool, Deep Pool, and Kids Pool. Open swim times will offer recreational play in pools of different sizes and temperatures. Pools may have limited availability, ask a lifeguard for more info. Swim Idaho! is a way for lap swimmers to chart their progress, set goals and conquer those goals. Swimming benchmarks are: 102 miles-the distance of the Boise River, 425 milesthe distance of the Salmon River, 779 miles-the distance of the length and width of Idaho and finally 1,076 milesthe distance of the mighty Snake River. T-shirts are awarded at each Idaho Bench Mark. Ask a Lifeguard how to start tracking your laps! ARE YOU READY TO SWIM WITH THE SHARKS? NRC swim lessons meet American Red Cross curriculum standards and all instructors are certified American Red Cross Water Safety Instructors. To view class descriptions, visit the “Aquatics” page on our website or stop by the Rec Center. Which Class? •	Each child must pass a particular level and granted a Red Cross Card before proceeding to the next level. •	All age requirements must be followed unless instructor’s approval has been granted. •	It is not uncommon for a child to stay in a particular level for several sessions before successful completion. •	Classes missed for vacation, injury, sickness or any other reason cannot be made up and are non-refundable. Our Adaptive Swim Lesson Program is for children and adults with special needs that may not be met through traditional swim lessons. The goal of this program is to provide students with a structured aquatic experience designed to make them feel comfortable and safe while swimming. If interested, fill out an Adaptive Lesson Request form, available on the “Programs” page on our website or at the NRC program desk. Have you ever wanted to paint? Do you think it is possible for you to walk away with a painting that anyone would be proud to display on their wall? Well it IS. And you CAN! All supplies included to complete a 12â&#x20AC;? x 16â&#x20AC;? painting in class. Register for one or all the classes. The City of Nampa offers different horticulture workshops to help gardeners and homeowners develop a green thumb and keep their trees and plants healthy! All classes are free but registration is encouraged. All classes are held in Council Chambers at City Hall, 6-8pm. Learn simple and easy to use techniques that will make your life as a parent more enjoyable and less stressful while raising more responsible children. You will learn how to avoid power struggles while setting limits, stay calm in stressful parenting situations, and teach your children healthy problem solving skills which will see them through many of life’s challenges. February 7 – March 14 Thursdays 6-8pm Nampa Recreation Center Member Individual $45, Non-Member Individual $50 Member Couple $55, Non-Member Couple $60 Instructor: Michele Garrison *Required Parenting the Love and Logic way parent handbook to be purchased from instructor in class for $15 *No children allowed in class. Childcare is available in our Play Center. This class teaches self confidence, builds self-esteem and improves balance, while establishing discipline and courtesy towards others. Participants will learn age appropriate self-defense and weapons training. These classes are nonviolent; sparring is optional. Don’t have a team? The Recreation Dept maintains a list of individuals who are looking for a spot on a team. Captains may pick up players from this list or entire teams can be formed. Contact us for more information or to add your name to the list 208-468-5858. League Fees $350 by April 16 $385 by April 23 (last day to register) Player’s fees Nampa Residents $10, Non-Residents $15 Informational meeting April 9 at 6pm in the Senior Center. Please attend to receive important league information. Half court play is available 7 days a week. Specific courts may be closed to allow for special events. Whether you are new to the exciting world of rock climbing or a seasoned pro, the Rec Center rock walls have something for everyone. Come climb with us; youâ&#x20AC;&#x2122;ll have fun and get fit at the same time. For rules or to download the waiver, visit the â&#x20AC;&#x153;Rock Climbingâ&#x20AC;? page on our website or call the Nampa Rec Center. Open during Rec Center hours All new routes. All shows in Jewett Auditorium at the College of Idaho. Tickets and info at www.caldwellfinearts.org or 208-459-5275. Try one of our Group or Aquatic Fitness classes for a motivating and comprehensive workout. Classes are offered at no additional cost for members and day pass users. The Senior Center, adjoining the Nampa Recreation Center’s east side, is a wonderful place for seniors to enjoy an assortment of fun activities. Dances, card games, and educational workshops are all available! See monthly activity schedules at www.nampareccenter.org. Volunteers are always welcome! Contact the Senior Center at 208-467-7266 for details. Daily lunch is served to the public Monday through Friday at 12:00 noon. The public is welcome! You do not need to be a senior to enjoy our lunches and/ or other activities. Fees: 60 yrs+ $5 suggested donation Under 60 yrs $6 charge Transportation to and from the Senior Center is available within its service area. Contact the Senior Center for details. Monthly menus are available online at www.nampareccenter.org. Our Gift and Thrift Shops are open in the Senior Center from 10am-12pm & 12:30p-2pm, Monday-Friday. Current group and aquatic fitness schedules with class descriptions are available at the Rec Center or on our website under “Fitness Schedules”. This 6,700 yard, par 72 course offers generous fairways, large greens with various slopes and elevations, bunkers and water hazards. Scenic views of the Treasure Valley with great amenities combined with affordable rates makes Centennial a great place to golf. Centennial is playable for golfers of all abilities and is a great place to bring the entire family for a round of golf and usually the course is playable all year. Centennial Golf Course has an 18-hole golf course, driving range, practice putting green, short game complex, instruction for individuals or groups, pro shop, clubhouse with snack bar, dining area and outdoor deck. Call 208-468-5889 to book your tee time, up to 5 days in advance! For more information visit www.centennialgolf.net. Every Thursday is Ladies Day on the Wee-9 at Ridgecrest Golf Club. Enjoy discounted Green Fees of $10 + tax. Family Fun Nights are a great way to get the family out on the golf course and save some money! Take advantage of this great promotion every Saturday & Sunday after 4:00pm and spend your evening with us. Each group must have at least one adult and one child (17 & under) to receive the discounted rate. Some youth golf clubs are available for use. Are you planning a wedding, family gathering, company party, special event or picnic? The Nampa Parks and Recreation Department is here to help! We invite you to reserve one of the many multi-purpose facilities the department offers. After Hours Rental $800 for 4 hours ($100 each additional hour) Additional fee for pool area. Call the Rec Center for details and reservations. Weâ&#x20AC;&#x2122;ll provide a designated space for 2 hours, personalized birthday banner and balloon bouquet! Enjoy a variety of activities in our facility for the entire day at a discounted rate. $45 room rental ($17 each additional hour) Call the Rec Center to reserve the room. West Park Shelter by restrooms $40 Shelter by pond $40 Rec Center Park Shelter $40 Lloyd Square Park $150 Athletic Fields $30/game For more info or to reserve a facility, stop by the Program Desk in the Nampa Rec Center or visit nampaparks.org (no online reservation for Amphitheater, Lloyd Square and Athletic Fields). Minimum rates listed; prices will increase depending on group size. All fees include sales tax. Ridgecrest Golf Club provides a beautiful clubhouse that is the perfect setting for a multitude of events including weddings, receptions, parties, or reunions. Catering is available upon request. For more information and pricing call 208-468-5888. Kohlerlawn Cemetery is publicly owned and operated by the City of Nampa. The Cemetery is open to visitors each day beginning at dawn and closes each evening at dusk. For burial space fees, opening and closing prices, decoration guidelines and monument setting policies, please visit our website. Christmas trees may be dropped off at Kohlerlawn Cemetery beginning December 26 through January 18. Trees must be free of stands, lights and all ornamentation. Trees will be turned into mulch and used throughout our parks and trails. nampa parks & facility rentals 25 Cherry Ln. Roosevelt Ave. & S. Powerline Rd. 2nd St. N. & 17th Ave. N. East Lakeview Park Garrity Blvd. & 16th Ave N. 11th Ave. N. Ext. & Stampede Dr. 9th Ave. & 4th St. N. 2nd Ave. N. & 4th St. N. Ext. Davis Ave. & Winther Blvd. Lone Star & Midland Blvd. W. Iowa Ave & Torrey Ln. 12th Ave. & Constituion Wy. Sunnyridge & Constitution Wy. Queens Dr. & Little John Ct. 11th Ave. N. Ext. & Birch Ln. The City offers miles of existing pathways and trails and has developed a bike and pedestrian master plan that projects for more pathways and trails in the future. Nampa citizens and visitors will enjoy running, walking, in-line skating or bicycling on the Nampa Pathway System. For maps, etiquette and more, visit our website. Stop by the Nampa Rec Center to pick up a copy of the Parks & Pathways pocket map to take with you while you explore all the pathways in Nampa! E. Amity & 2nd St. S. 14th Ave. N. East Karcher Rd. Midway Rd. & Smith Ave.
NEW EQUIPMENT• GROUP FIT CLASSES • FULLY EQUIPPED WEIGHT ROOM TRX® STUDIO • SWIMMING POOLS• ROCK CLIMBING• BASKETBALL COURTS ...AND SO MUCH MORE! Get 4 FREE personal training sessions to get you on the right track! There’s so much variety at the Nampa Rec Center to enhance your workouts, reach your fitness goals, and have fun doing it!